Michele Chernesky looks upfield. 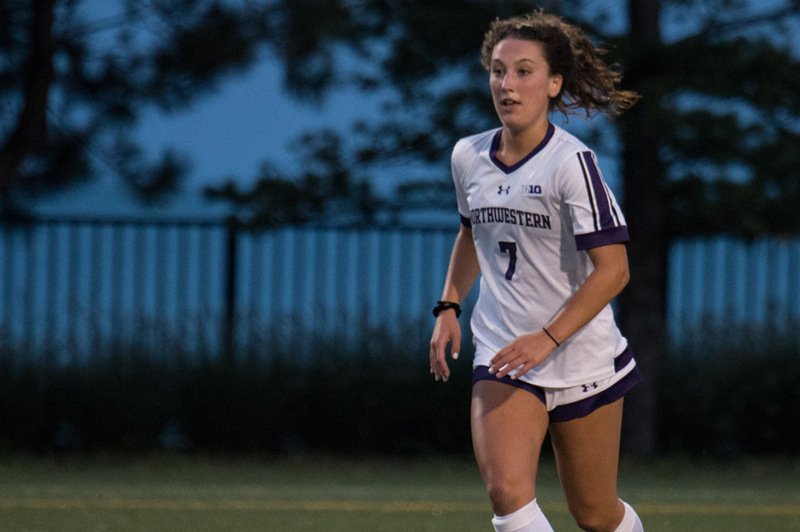 The junior midfielder scored the game-winning goal in Northwestern’s 1-0 win over Purdue on Sunday. Northwestern was deadlocked with Purdue at zero with three minutes to go in the Big Ten Tournament quarterfinals, fighting to advance to the next round. It was a big moment, and the Cats had a lot on their minds. “We just really didn’t want to go to overtime,” junior midfielder Michele Chernesky said. NU (11-6-2, 7-3-1 Big Ten) won 1-0 against seventh-seeded Purdue (10-7-2, 5-4-2) after Chernesky scored in the 88th minute on a breakaway opportunity. She said it felt like time had temporarily frozen as she held possession with only the goalkeeper in front of her. Then, her goal sealed the win. Though four consecutive shutout wins to close the season put NU as the higher seed, the Boilermakers were in the midst of their most successful season since 2008, the last time Purdue qualified for the Big Ten Tournament. Their offense, led by Big Ten Forward of the Year Maddy Williams, challenged the Cats’ defense throughout the match. Purdue tallied nine shots in the second half, including six in the first 10 minutes, but senior goalkeeper Lauren Clem or an NU defender stopped each opportunity. Nearly 10 minutes into the second half, the Boilermakers sent a throw-in into the box and two forwards had a chance to shoot. Clem blocked the first attempt, while junior defender Hannah Davison dove into an empty net to stop the second and keep the game scoreless. Moynihan said he had no idea who made the save or how the Cats got the ball out of the box. Clem’s leadership of the back line, Moynihan said, was enough to keep Purdue off the board. While the Cats’ seniors have made the Big Ten Tournament every year — the only group to do so under Moynihan — the Boilermakers, whose seniors are playing in their first Big Ten Tournament, are rebuilding their program. Purdue’s progression reminded Moynihan of the work he did to bring his team back to the postseason. Moynihan said the Cats’ October loss in West Lafayette motivated them to bounce back in the rematch against Purdue. Following NU’s victory against Purdue, the Cats advance to face sixth-seeded Wisconsin in the Big Ten Tournament semifinals Friday in Westfield, Indiana. The Badgers, who advanced by upsetting Minnesota 2-0 behind one of the strongest defenses in the Big Ten, will make scoring even more difficult for the Cats. NU beat the Badgers 2-0 at home earlier in the season, though, and Moynihan said the Cats’ chemistry, aggression and experience can lead them to a win against Wisconsin as well as their first Big Ten Tournament championship.